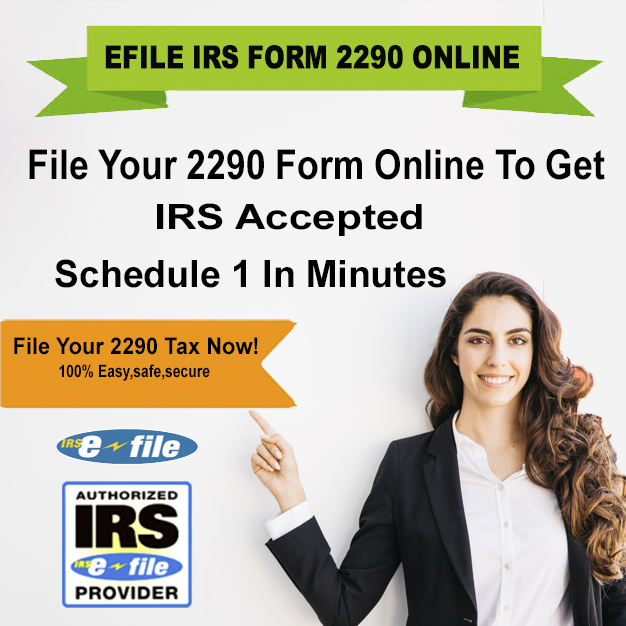 E File Form 2290 – An easy and simple process to File Form 2290 and to Pay 2290 Tax Online. You can find the smart methods to File 2290 Online. Efiling IRS Form 2290 is the best process to save your money and time. An IRS support Filing to pay Heavy Vehicle Use Tax which reduces the burden of Filing 2290. You can act on time by choosing Form 2290 Online to pay Heavy Highway Use Tax and to get IRS Stamped Schedule 1 within minutes. If you want the best and secure filing then choose HVUT 2290 Online process. You can File 2290 Online annually within less than five minutes. File Form 2290 Online by choosing irsform2290online.com for secure and fast filing. In the below sections of this article, you can get complete details of 2290 filing in an online. Filers cannot use their SSN number instead of EIN Number. If you don’t have an EIN, apply for an EIN quickly. After you get an EIN, you can apply for IRS 2290 E File. An EIN is mandatory to E File Form 2290. You have all the details of your vehicles along with their VINs to File HVUT 2290 Online. Also, one must enter VIN in the 2290 Schedule 1 Proof to get it through email. The VIN is also necessary to finish your Form 2290 Filing. You are going to pay Heavy Highway Tax for the heavy vehicle whose gross weight is 55,000 pounds or more. To know the exact amount you need to pay as tax, you must mention the gross weight of a vehicle while IRS 2290 Filing. The month of the heavy vehicle first started running on public highways must be entered in the 2290 Form to File IRS Form 2290 Online. If you are filing 2290 Online for a suspended vehicle then you must enter the mileage limit of a vehicle in the 2290 Tax Form. You find the user-friendly filing steps or IRS Form 2290 Instructions below. 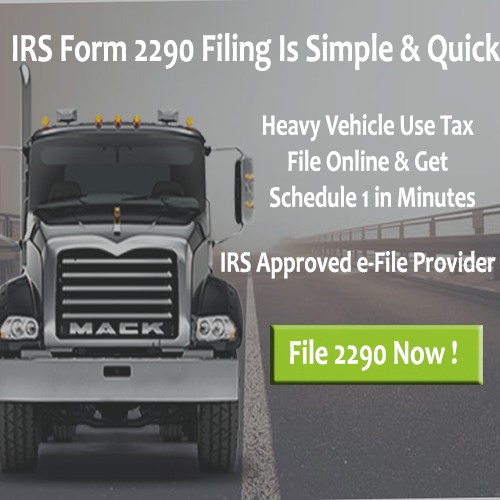 File & Pay Form 2290 Online and get immediate Schedule 1 Form 2290. IRS Form 2290 E File with the simple steps. 1. Create a Free Registration Account. 2. Enter the details in Efile Form 2290. 4. Audit and Submit the details. You can get free registration account to finish the 2290 IRS Form Online Filing. If you registered for once, you can use that account annually without entering all the information every time. Enter Email, Password, PhoneNumber to get Sign Up. 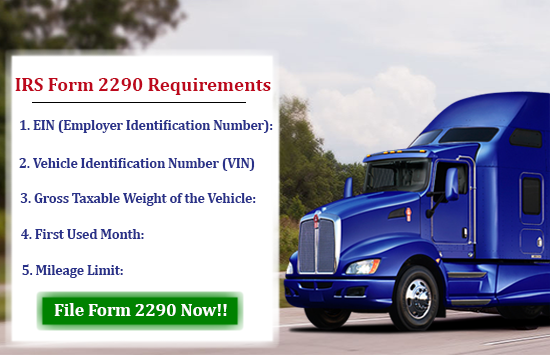 Enter Business, EIN, and VIN details in 2290 Form and to File Heavy Vehicle Use Tax Form 2290 Online. Choose the best IRS Payment Option and pay the Heavy Vehicle Use Tax. Check your details once and click on the submit button. If you find any errors correct hem and then submit the details. Immediate IRS Schedule 1 is yours if once the IRS accepts your 2290 Online Form. Mostly, within five minutes, you can get the IRS Stamped Schedule 1 through email or fax. You can find SSL-encrypted security for your details enter in the IRS Form 2290. The information is stored in the cloud which is encrypted and not taken by others. Finish your HVUT 2290 Tax Payment with an affordable price. No hidden cost impose on your 2290 Filing. Our user-friendly 2290 Filing Form help you to finish your 2290 Online Filing within minutes without any software. You can quickly change your mistakenly entered VIN Number with the E File Form 2290. As audit check proceeds on your data, you can File IRS 2290 without any mistakes. Error-Free Filing helps you from IRS rejections. No need to wait many days to File 2290 Online. You can get immediate Schedule 1 within minutes without any late. Get in touch with us or Call us at: (316) 869-0948 for better Form 2290 Online Filing. Fast & Secure filing to get immediate IRS Schedule 1 in minutes. 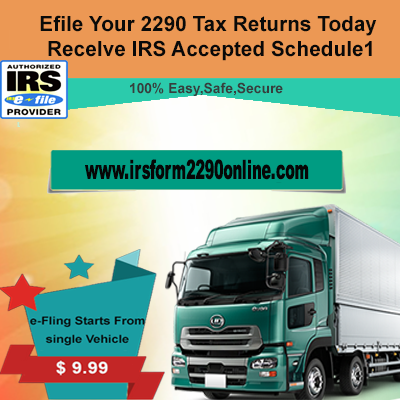 You are at the best IRS Efile Provider to make your IRS Form 2290 Filing easy.